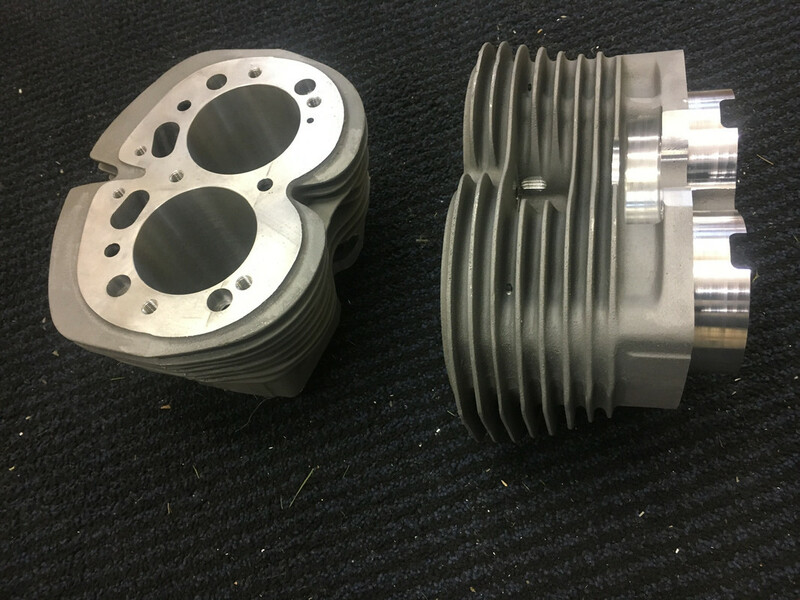 In order to use my Fullauto cylinder head with big valves, I will need to change the 750 barrel from my new bike to a 850 barrel, they are no more in stock by Maney, but Fast Eddy give me the link to Norvil and Norvil got some alloy barrel listed. So my quetion is: do someone use this kind of barrel? I know of one person who used the Norvil 850 Barrels Yves and said they were good. The price between them is very similar. Both companies have their critics, personally, I’d have more faith in Andy than Les. I believe the Molnar barrels are the Maney design. I’ve not seen them Ken, maybe B+Bogus can tell us. Actually, I heard that Andy bought the moulds from Pete Lovell. Even if the base part is good if the part you have is wrong Les will tell you it's your fault. Ludwig was visiting me last week, what a intresting man, I will ask him to go to his home and see is barrel, his home is only a few miles from my home. I use the norvil and also the maney barrel for many years, I had no problems with them. The Norvil looks like the original pattern. Marinatlas has a good memory . Yes , I have a Norvil barrel on my Commando for around 70 000 km and it is doing fine so far . Good compression , negligable oil consumption . I like them because they look so similar with the cast iron barrels . Just one fin less . I also painted them black . BUT : the ss hardware that comes with it is worthless . The helicoils ( all five ) pulled out at 1st retorque . I made bronze inserts 20 mm long , and used longer ( metric) bolts . I would have liked to use a wider , coarser thread for the inserts , but with an 850 barrel , I was afraid to interfere with the cylinder sleeve . Also some issues with the 2 front studs below the exhausts , and a few other minor things . Apart from that , they are an exellent product . motorson, xbacksideslider, Kvinnhering and 1 other person like this. Yes , I have a Norvil barrel on my Commando for around 70 000 km now and it is doing fine . Just wondering do you use that steering damper? Or is it backed right off to use when needed? The bike steers perfectly well without a steering damper . It is an LSL damper, added for extra security . Setting depends on road condition . Ludwig; i like you tank. is it steel? and who supplies them? It started live as a Gus Kuhn 6 gallon alloy tank , but I modified it at diff. points , narrower at the knees , etc .. Paint pattern is intended to make it look less massive , altough easthetics are not my first priority . Interesting. Definitely not the Maney design. The only point I would make is that Jim Comstock has tried this style (no liners) and found that because of the assymetric design, he couldn't get the bores to stay round. What do you think, Jim? Yes some people had tried nikasil and they found some distortion, I had called Steve Maney years ago about and he confirm .